The volume also contains an introduction, a full vocabulary, a chronological table of important dates and events in Cicero's life, three maps, and a bibliography. Illustrations may also be included. One of the true pleasures of becoming fluent in Latin is being able to enjoy the writing speeches and writings of Marcius Tullius Cicero in his own language. A gifted orator, statesman, and philosopher, Cicero was a contemporary of such luminaries as Julius Caesar, Pompey, Crassus, marc Antony, and Octavian during the final years of the Roman Republic and witness to the events that were to give rise to the Roman Empire. 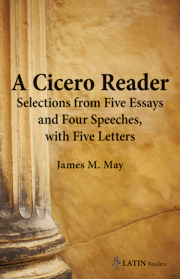 "A Cicero Reader: Selections from Five Essays and Four Speeches, With Five Letters" by James M. May (Professor of Classics, St. Olaf College, Northfield, Minnesota) is a superbly presented, 136 page compendium that begins with an introduction to Cicero's life, accomplishments, and world. Comprised of 605 lines of unadapted Latin text selected from eleven of Cicero's orations and writings, "A Cicero Reader" is augmented for the student informative notes, a complete vocabulary, suggested readings, a chronological appendix, two maps, and an illustration. An excellent curriculum supplemental resource, "A Cicero Reader" is very highly recommended for personal and academic library Latin Language instructional reference collections and supplemental reading lists.